Nerve conduction and EMG studies are an important procedure for evaluating possible peripheral nervous system (PNS) disorders. EMG can be considered an extension of the clinical neurologic examination, rather than simply a test, and is ordered by many healthcare providers from all specialties. Choosing which patients to refer for EMG is important because there are costs of patient time, money, and perhaps most importantly, pain intrinsically associated with EMG itself.1 This review addresses the types of patients and pain that warrant referral to EMG and when to consider this a useful diagnostic study. Accurate muscle selection is an important and modifiable aspect of the pain caused by EMG, making it crucial that electromyographers perform accurate muscle selection.7 Although the procedure may induce pain, it is important to note that it is not a severely painful experience for most patients. A study found that 82% of patients said the test was “not as bad as they expected,” and most patients noted only mild pain.8 It is important that referrals include clear descriptions of symptoms and a thoughtful diagnostic question for the electromyographer to evaluate (Box). It is also important to remember that pain is not the only risk of the study. EMGs carry intrinsic hazards, including the rare cases of electrical injury, bleeding, or infection.9 Although these are extremely uncommon, the risks warrant at least ensuring that the study is necessary before referring. Electrodiagnostic tests that are painless may also be considered for diagnosing neuromuscular diseases including surface EMG (sEMG), which can complement a nerve conduction study and/or needle examination. Muscle signals are examined with surface electrodes in sEMG rather than through the traditional needle electrode. Currently, sEMG is mostly used to evaluate nonneurologic diagnoses. An evidence-based review from the American Association of Neuromuscular and Electrodiagnostic Medicine (AANEM) suggests there is class C evidence that sEMG may be helpful in diagnosing neuromuscular diseases; it is rarely used for this purpose, and that is likely to remain so until further studies are done.10 A more frequently used “pain-free” electrodiagnostic test is neuromuscular ultrasound, which is used to diagnose neuropathies and focal deficits and monitor muscle health. Neuromuscular ultrasound is accurate for diagnosis of median neuropathy at the wrist, and level A evidence suggests it may be offered for this diagnosis.11 For patients in pain caused by median neuropathies, or for example from wrist arthritis leading to the compression, an accurate pain-free study may be quite helpful. Because EMG is an electrophysiologic measure, it is important to consider the physiology of pain itself, which is perhaps best studied in myofascial pain. EMG is often used for diagnosing orthopedic injuries such as patellofemoral pain syndrome (PFPS) through sEMG. In PFPS, sEMG assesses vastus muscle inhibition or activation and is 70% specific and 84% sensitive, although an activity instability test has higher positive predictive value (100%) suggesting clinical diagnoses are equally or more useful.12 Surface EMG has been examined in patients with myofascial pain compared to normal control subjects, and a new technique showed accuracy to differentiate 60-85% of patients with myofascial pain from control subjects, suggesting there is inherent physiologic change to muscle in a state of pain.13 In contrast, a review article on sEMG activity in musicians, who have a high prevalence of musculoskeletal pain, found that sEMG utility varied, depending on which muscles were studied.14 Therefore, pain is not always associated with increased sEMG activity. Unfortunately, it seems that sEMG is not likely to be able to differentiate well between different causes of muscle pain. For example, a study of patients with fibromyalgia versus focal chronic neck/shoulder muscle tension had similar electrophysiology findings in the neck but patients with fibromyalgia had more widespread generalized muscle pain responses.18 There is likely alteration in muscle activity versus hypoactivity that occurs on surface EMG when muscles experience pain, but that has not been well studied from the physiologic perspective of needle EMG diagnosis. Figure 1: Algorithm for considering whether to send a patient who has pain for EMG. If the algorithm does not clearly lead to the EMG, carefully weigh the costs and potential pain for patient against the likely diagnostic benefit of EMG. Like any diagnostic procedure or test, EMG is not perfect. A normal result does not mean a patient does not have a deficit in their nerve or muscle. Whether median neuropathy at the wrist or carpal tunnel syndrome are present is the most referred question for EMG.6 The challenge of assessing sensitivity and specificity for any diagnosis is what to consider the gold standard, and typically, this is clinical suspicion or exam findings. In median neuropathy, when compared to the clinical criteria of carpal tunnel, 25% of patients in a study did not have findings of median neuropathy at the wrist by EMG.19 Therefore, it is useful to consider what a test will add to management of an individual patient. It is likely that for carpal tunnel, if a patient meets clinical diagnosis, further testing is not immediately necessary. However, for patients who only meet partial clinical criteria or if a clinician is debating an alternative diagnosis, the test may indeed be quite warranted and useful (Figure 1). 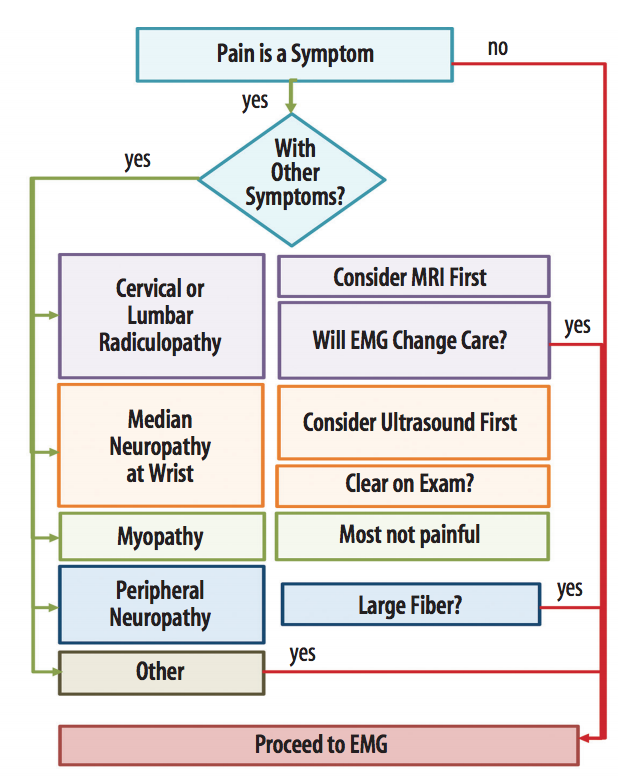 Although in patients with suspected peripheral neuropathy EMG is commonly recommended, it is important to remember that the examination will only be able to comment on large-fiber processes. For patients in whom pain is an issue, this typically indicates that small fibers are affected. Patients who have burning pain alone or burning pain with loss of pinprick/temperature sensation are thought to have small fiber issues and may have normal EMGs. If there is a sensory deficit with vibration or proprioception indicative of a large-fiber neuropathy, then the EMG may indeed be important to pursue. Most electromyographers report neuropathy if sural amplitudes are reduced, although that may only have a sensitivity of 66%.20 Some have studied neuropathy diagnoses comparing a ratio of sural to radial sensory nerve conduction, and this may increase sensitivity to 90% though this is not yet routine.20 Again it is important to recall that the gold standard is typically considered the clinical diagnosis thus making sensitivity difficult to clarify. 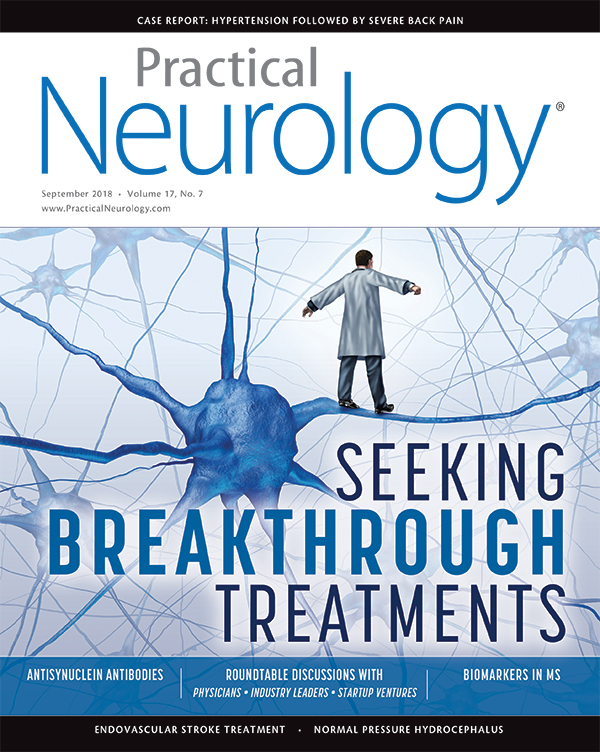 If a patient has large-fiber neuropathy clinically, the EMG may be pursued to determine if there is axonal damage versus demyelinating or progressive disease but may not be needed or useful if the suspicion is for a small fiber neuropathy. Radiculopathy is a commonly missed diagnosis with EMG and also commonly associated with pain.21-23 The missed diagnoses may occur because unless the radiculopathy affects the muscle, and therefore causes areas of denervation, the needle EMG may be normal even though the nerve is compressed leading to pain. A spinal MRI is more accurate for visualizing compressed nerves when pain is the only symptom. A study examining clinical suspicion versus electrodiagnostic findings for radiculopathy found that a normal exam can still find an abnormal EMG and vice versa and therefore both are useful in the diagnostic armamentarium.21 This argues that when cervical radiculopathy is suspected or diagnosed clinically, patients should have an imaging study regardless of EMG findings. Cervical radiculopathy was evaluated by the AANEM in 1999; at that time, they found a sensitivity of 50-71%, noting that EMG was almost always abnormal when motor deficits were present.22 There was a correlation between needle and radiologic examinations in 65-85% of patients,22 but specificity is limited likely due to infrequent reporting of normal data. For lumbosacral radiculopathy there is a similarly low sensitivity; as few as 42% people with lumbosacral radiculopathy have abnormal EMGs compared to using MRI and clinical suspicion together as gold standard.23 The patients for whom to consider EMG for radiculopathy may be those with symptoms not correlating with imaging due to the high false-positive rate in imaging or when multilevel disease is present and the question is which level is affecting the patient most. It can be quite useful to consider EMG for patients who can not tolerate neurologic examination because of their pain. For most muscle diseases there is no associated direct muscle pain, although there is frequently pain from overuse in stronger muscles. Myopathy or myositis, like radiculopathy, remains a difficult diagnosis on EMG. The gold standard is clearer because pathology is often performed through muscle biopsy. For myopathic disorders the EMG sensitivity is thought to be 74% although specificity is a bit lower at 67%.24 This same study found that creatine kinase levels over 1000 U/L had a specificity of 94% (with sensitivity of 48%).24 For patients with muscle pain who have a normal CK level, the added pain of an EMG may be unnecessary. Instead, if further testing is needed, a muscle MRI may be more useful than EMG. When pain is the only symptom, it is inherently vague and leaves care providers debating whether pain is a nerve or muscle problem. To answer this question in more detail, we conducted an institutional research board (IRB)-approved retrospective chart review of 602 referrals to our academic university’s neurodiagnostic center. All patients referred over a 6-month period were included and the reason for referral (diagnostic question and symptoms), as well as results of the EMG were documented and analyzed (Figure 2). Of the 602 patients, only 490 patients had symptoms described within the EMG referral. Of these, 184 patients (37.6%) had pain listed as a symptom upon referral. For this study, pain was defined as documentation of pain, ache, or burning. Pain was the second most common symptom listed after numbness (216 patients with numbness, 44.1%). The most commonly referred questions associated with pain as a symptom were cervical radiculopathy (26.9%), carpal tunnel syndrome (19.7%), lumbosacral radiculopathy (18.0%), and peripheral neuropathy (15.6%). 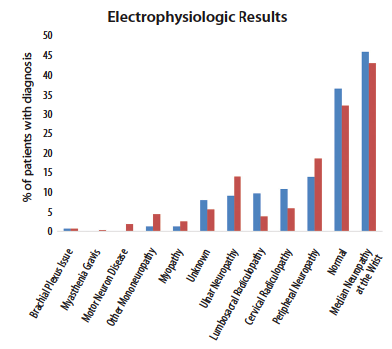 Figure 2: The electrophysiologic results of all patients referred to one academic hospital’s neurodiagnostic lab broken into whether patient symptoms included pain (blue) or not (red). Although the referral paperwork requested clinical information and reason for referral to EMG, this was not provided for many patients such that only symptoms were given without any question (eg, stating “thumb numbness” instead of “thumb numbness, question median neuropathy versus C6 radiculopathy”). Only 40.5% of patients for whom symptoms were given also had a specific diagnostic question given on their referral form. When pain was a referral symptom, 67 of 184 (36.4%) referrals resulted in a normal EMG diagnosis, which was not significantly different than the rate of normal results for patients without pain as a symptom (32%). Pain was listed as the only symptom for 63 EMG referrals; in this group 26 (41.2%) referrals resulted in a normal diagnosis (P = 0.16 when compared to patients with no pain). The most common EMG diagnosis with pain as a referral symptom was median neuropathy at the wrist (45.7%), which was also the most frequent diagnosis for referrals. Other common diagnoses with pain include peripheral neuropathy (13.8%), cervical radiculopathy (10.8%), and then lumbosacral radiculopathy (9.6%). Pain is a common symptom, second only to numbness, that prompts clinicians to refer for an EMG, although little is truly understood about the electrophysiology of pain beyond myofascial pain. Because EMG is meant to be an extension of the neurologic examination, the question remains: What is pain on the neurologic examination? Patients tend to have more normal results when pain is their only symptom. For example, radiculopathies without weakness tend to result in normal EMG findings more than radiculopathy with weakness.22 It is important to remember normal EMG results do not mean a normal PNS. Combined with the understanding that EMG can be time-consuming, costly, and painful, it is important to first consider whether patients have pain alone or pain in addition to other symptoms. If referral continues after that question is answered, the next step for the provider is to consider what diagnostic question an EMG might answer. EMG for processes linked to pain such as radiculopathies have a low sensitivity compared to diagnoses like median neuropathies at the wrist. The pathophysiology of pain is still largely unknown, and pain remains a challenge to diagnose. If obtaining an EMG will change the diagnosis or treatment or if pain limits obtaining a neurologic examination, then it is more warranted to refer the patient for an EMG. 1. Strommen JA, Daube JR. Determinants of pain in needle electromyography. Clinical Neurophysiology. 2001;112(8):1414-1418. 2. London ZN. Safety and pain in electrodiagnostic studies. Muscle Nerve. 2017;55(2):149-159. 3. Richardson JK, Evans JE, Warner JH. Information effect on the perception of pain during electromyography. Arch Phys Med Rehabil. 1994;75(6):671-675. 4. Khoshbin S, Hallett M, Lunbeck R. Predictors of patients’ experience of pain in EMG. Muscle Nerve. 1987;10(7):629-632. 5. American Association of Electrodiagnostic Medicine. Position statement: overview of electrodiagnostic medicine. AANEM Web site. http://www.aanem.org/getmedia/c50c666e-c04b-46bc-9156-6f1f986db5e1/PositionStatement-Overview_of_EDX_Med.pdf.aspx. Published 1999. Revised and reapproved June 2013. Accessed August 27, 2018. 6. Mondelli M, Aretini A, Greco G. Knowledge of electromyography (EMG) in patients undergoing EMG examinations. Funct Neurol. 2014;29(3):195-200. 7. London ZN, Burke JF, Hazan R, Hastings MM, Callaghan BC. Electromyography-related pain: muscle selection is the key modifiable study characteristic. Muscle Nerve. 2014;49(4):570-574. 8. Kothari MJ, Preston DC, Plotkin GM, Venkatesh S, Shefner JM, Logigian EL. Electromyography: do the diagnostic ends justify the means? Arch Phys Med Rehabil. 1995;76(10):947-949. 9. Al-Shekhlee A, Shapiro BE, Preston DC. Iatrogenic complications and risks of nerve conduction studies and needle electromyography. Muscle Nerve. 2003;27(5):517-526. 10. Meekins GD, So Y, Quan D. American Association of Neuromuscular & Electrodiagnostic Medicine evidenced-based review: use of surface electromyography in the diagnosis and study of neuromuscular disorders. Muscle Nerve. 2008;38(4):1219-1224. 11. Cartwright M, Hobson-Webb L, Boon A, et al. Evidence-based guideline: neuromuscular ultrasound for the diagnosis of carpal tunnel syndrome. Muscle Nerve. 2012;46:287-293. 12. Ferrari D, Kuriki HU, Silva CR, et al. Diagnostic accuracy of the electromyography parameters associated with anterior knee pain in the diagnosis of patellofemoral pain syndrome. Arch Phys Med Rehabil. 2014;95(8):1521-1526. 13. Lin Y-C, Yu N-Y, Jiang C-F, Chang S-H. Characterizing the SEMG patterns with myofascial pain using a multi-scale wavelet model through machine learning approaches. J Electromyogr Kinesiol. 2018;41:147-153. 14. Overton M, Plessis Du H, Sole G. Electromyography of neck and shoulder muscles in instrumental musicians with musculoskeletal pain compared to asymptomatic controls: A systematic review and meta-analysis. Musculoskelet Sci Pract. 2018;36:32-42. 15. Falla DL, Jull GA, Hodges PW. Patients with neck pain demonstrate reduced electromyographic activity of the deep cervical flexor muscles during performance of the craniocervical flexion test. Spine. 2004;29(19):2108-2114. 16. Lund JP, Donga R, Widmer CG, Stohler CS. The pain-adaptation model: a discussion of the relationship between chronic musculoskeletal pain and motor activity. Canad J Physiol Pharmacol. 1991;69(5):683-694. 17. Hodges PW, Tucker K. Moving differently in pain: a new theory to explain the adaptation to pain. Pain. 2011;152(3 Suppl):S90-S98. 18. Nilsen KB, Westgaard RH, Stovner LJ, et al. Pain induced by low-grade stress in patients with fibromyalgia and chronic shoulder/neck pain, relation to surface electromyography. Eur J Pain. 2012;10(7):615-615. 19. Witt JC, Hentz JG, Stevens JC. Carpal tunnel syndrome with normal nerve conduction studies. Muscle Nerve. 2004;29(4):515-522. 20. Rutkove SB, Kothari MJ, Raynor EM, et al. Sural/radial amplitude ratio in the diagnosis of mild axonal polyneuropathy. Muscle Nerve. 1997;20(10):1236-1241. 21. Inal EE, Eser F, Aktekin LA, Oksüz E, Bodur H. Comparison of clinical and electrophysiological findings in patients with suspected radiculopathies. J Back Musculoskelet Rehabil. 2013;26(2):169-173. 22. American Association of Electrodiagnostic Medicine, So YT. Guidelines in electrodiagnostic medicine. Practice parameter for needle electromyographic evaluation of patients with suspected cervical radiculopathy. Muscle Nerve. Suppl. 1999;8:S209-S221. 23. Mondelli M, Aretini A, Arriqucci U, et a.. Clinical findings and electrodiagnostic testing in 108 consecutive cases of lumbosacral radiculopathy due to herniated disc. Neurophysiol Clin. 2013; 43(4): 205-215. 24. Cardy CM, Potter T. The predictive value of creatine kinase, EMG and MRI in diagnosing muscle disease. Rheumatology. 2007;46(10):1617-1618. The authors have no relevant financial or other relationships to disclose.